Savannah is the embodiment of the idyllic Southern city with grand old mansions, green parks with fountains and huge moss-draped trees, and cobbled streets along the waterfront. These all combine to provide a beguiling charm, and the atmosphere is always relaxed, giving the feel of a small Southern town. Savannah lies on the Atlantic coast at the mouth of the Savannah River, directly on the border with South Carolina. It was the first town in North America to be laid out on a regular plan, part of which was a large number of lovely historic squares throughout the city. The city was spared from destruction at the hands of Union troops, and as a result it is full of rare examples of original Southern architecture. Today, Savannah is a bustling modern city that retains its historic charm while welcoming tourists to experience all it has to offer. The best way of getting to know Savannah's historic district is to take a stroll along Bull Street and the side streets that extend in either direction. The starting point is City Hall (1905), opposite which is the U.S. Customs House, built in 1852 on the site of the colony's first public building. To the south of this is Johnson Square, the first square laid out in the new planned town, with the Christ Episcopal Church (1838) on the site of the colony's first church of 1733. There are many historic squares to explore in this section of Savannah. Along this stretch are also coffee shops and restaurants, some with outdoor tables that are perfect for people-watching. For a more memorable experience, see Bull Street from the comfort of a horse drawn carriage or a Savannah Hop-on Hop-off Trolley Tour, where you can also learn a little history. Forsyth Park is the largest and most active park in Savannah. It was created in the mid-19th century, at a time when large parks were fashionable in American cities. The large, cast-iron fountain was placed here in 1858 and intended to be the focal point of the park. It has remained the primary feature in the park since that time, with several periods of restoration, including the most recent major restoration in the late 1980s. Forsyth Park is also a lovely area to walk, with large shady trees and paved paths. Surrounding the park are a number of interesting old buildings. In the spring, the park puts on a great display of color when the azaleas are in full bloom. Within the park is the visitor center and Band Shell, with amenities that include a café and snack bar. The National Museum of the Mighty Eighth Air Force, located just outside Savannah, is one of the nation's top museums dedicated to World War II history. In addition to a memorial and extensive information about the Eighth Air Force regiment, the museum has many historic exhibits that explore various phases of the conflict. Visitors begin with an introduction to Germany in the wake of WWI and look at how the Nazi regime was able to rise to power with the use of propaganda. Exhibits also include films about life as a bomber pilot and a re-created airfield, as well as dioramas and interactive exhibits. Museum collections include a B-17 Flying Fortress and other WWII aircraft, as well as scale models. There are also extensive displays containing the personal stories and belongings of members of the Mighty Eighth. Military enthusiasts will also enjoy the Webb Military Museum, located in downtown Savannah, where you can view a variety of military artifacts that cover all branches and conflicts from the Civil War through Desert Storm. 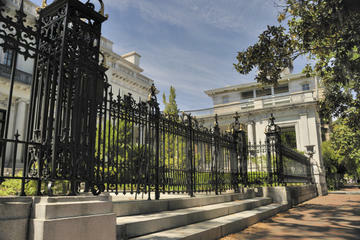 The Telfair Academy of Arts and Sciences, more commonly called the Telfair Museum of Art, has been operated by the Georgia Historical Society since it opened in 1886, and it is the oldest art museum in the state. Art Collections include European and American works in a variety of media with a focus on 19th- and 20th-century art. Among the featured artists are Robert Henri, George Luks, and Childe Hassam. The museum is also home to a sculpture gallery and rotunda added by architect Detlef Lienau. The building that houses the museum, a 200-year-old mansion designed in the Neoclassical Regency style, is equally impressive. The museum includes 19th-century period rooms and offers a self-guided audio tour that focuses on the architecture. Guided tours are also available, free of charge, and delve into the museum's history and details about its content. The Cathedral of St. John the Baptist in Savannah was first built in the 1870s and then rebuilt in 1899 after a severe fire. It took more than a decade to redecorate the new cathedral. The building again underwent restoration work in the 1950s and 60s, and more work was done in the 80s and 90s. The interior is a delight, with marble railings and floors and a marble altar. The main altar, carved in Italy, weighs 9,000 pounds. The Cathedral of St. John the Baptist is also well-known for its incredible Renaissance-style murals and a pipe organ with 2,308 pipes. Above the organ is the Great Rose Window, with panels radiating out from the images of St. Cecilia in the middle. There are also many other artful details to be found throughout the cathedral. Savannah's many public squares are one of its most attractive qualities, especially on a hot city afternoon when you need a spot of shade and a few moments with nature. Several of the best-known squares are located along historic Bull Street, including Chippewa Square, which is known for its appearance in the film Forrest Gump; the city's largest and oldest Johnson Square; and Madison Square, which is conveniently close to shopping and dining. Ellis and Franklin Squares are adjacent to the bustling City Market, and Ellis is home to a giant chess set, as well as a lovely fountain and shaded tables. Crawford Square, located at McDonough and Houston streets, has recreational facilities, including a gazebo and basketball court. Although smaller than most, Columbia Square is a peaceful respite within the surrounding city life. Other popular squares can be found along Barnard Street, including Chatham Square at Wayne Street, Orleans Square behind the Savannah Civic Center, and Pulaski Square at the intersection of West Macon, which is known for its tremendous live oaks. The birthplace of Juliette Gordon Low, a founder of the Girl Scouts of the USA, was built in 1821. Her family home, which was the first National Historic Landmark in Savannah, has been restored to how it looked in the 1880s and furnished with many original Gordon family pieces. In the Gallery are some of Gordon's original artworks, as well as some of the family's furnishings and memorabilia. Some of the collections on display in the house include jewelry, photographs, and written material. The house offers great insight into the lifestyle of the family and of the era. It also describes the achievements of Juliette Gordon Low and the history of the Girl Scouts and is a very popular destination for scout troops of all ages. Bonaventure Cemetery is one of the best-known historic cemeteries in the country, loved for its sprawling Victorian layout and beautiful stonework monuments and brought into the limelight as the setting for the novel and film Midnight in the Garden of Good and Evil. The cemetery covers more than 100 acres, and its historic district is more than 14 acres, home to graves from as early as 1846. In addition to stunning marble tombs, the cemetery is the final resting place for nearly 1,300 veterans of the Civil War, the Spanish-American War, and other conflicts. A rewarding way to visit the cemetery is on a Bonaventure Cemetery Tour, guided by a local historian and author who shares fascinating information about the cemetery and the famous people who were laid to rest here. The Owens-Thomas House is Savannah's most important historic home thanks to its dedication to looking at the lives of the slaves who worked and lived here. The Slave Quarters are just part of the exhibits, which look at daily life for the 14 enslaved workers who ran the home, worked the grounds, and raised the children. Tours of the home discuss the complicated nature of relationships between the slave owners, children, and slaves themselves, and encourage visitors to continue to ask questions after they leave. The home is a National Historic Landmark and is operated by the Telfair Museums. Iron steps lead down from Factors Walk to the Riverfront, a row of 19th-century warehouses now occupied by shops and restaurants. This is a popular area day and night with old-style candy stores, like River Street Sweets that sells fresh fudge and other treats; the Peanut Store; unique art galleries; and souvenir vendors. Tourists can get excellent views of the port and suspension bridge from here or from Hutchinson Island. An ideal way to get the best Riverfront photo-ops is by taking the free ferry that brings tourists to the island and back, a ride that is particularly lovely in the evening. The Ralph Mark Gilbert Civil Rights Museum is named for the man who is credited with being the father of the civil rights movement in Savannah. Dr. Ralph Mark Gilbert was a pastor at the First African Baptist Church in Franklin Square and the president of the NAACP in Savannah for eight years. The museum itself honors Dr. Gilbert and his important roles and also explores the long and arduous path that African Americans have endured from the first slaves in Georgia to the present day. Exhibits include photographs, personal stories, little-known facts, a reading room, and interactive displays, as well as a film. The museum is located in the former home of the Wage Earners Savings and Loan Bank, significant as being one of the earliest and largest banks for African-Americans. Fort McAllister, now a State Historic Park, was used during the Civil War and contains some of the best preserved earthwork fortification of the Confederacy. It is an excellent example of coastal defenses during this time period. On the grounds are cannons and other military operational items, as well as a Civil War museum with interesting displays and information. Despite its historical significance, many people also visit the park simply for the recreational opportunities and the natural beauty. The park is located on the Great Ogeechee River south of Savannah and offers such activities as camping, hiking, fishing, and picnicking in a lovely treed area. There are a limited number of cabins available for rent. Trails offer places to walk or bike and there is some children's equipment. Since winter months can be cool and midsummer can be blazing hot, the spring and fall are generally the best times to visit. Old Fort Jackson is the oldest standing fort in the state of Georgia. The original brick fort, one of only a few Second System fortifications still left standing in the United States, was begun in 1808. It was manned during the War of 1812 and was also active during the Civil War. Today, it is a National Historic Landmark, preserved and managed by the Coastal Heritage Society. On display at the fort are various exhibits on military history. The fort also features cannon firing demonstrations. Savannah's City Market is a favorite among both locals and tourists for its numerous things to do and upbeat atmosphere. Here, you can find working artist studios; plenty of dining options, from quick bites to full-service restaurants; and a variety of entertainment, from local musicians to nationally known artists. This is also a prime shopping destination, home to a wide variety of boutiques, an old-fashioned country store, a sweet shop with homemade candy, and even an entire store for dogs. Luxury Hotels: On Lafayette Square in the Historic District, the Hamilton-Turner Inn is a beautiful 1873 mansion, and was featured in the movie, Midnight in the Garden of Good and Evil. This charming inn features 17 individually designed suites, with high ceilings, four poster beds, claw-foot tubs, and other fine antique furnishings. With a fabulous location along the waterfront, The Bohemian Hotel Savannah Riverfront, Autograph Collection is an elegant hotel in a romantic 18th-century building, with views over the water and the Historic District. In the heart of the old city, steps from Bull Street, the Eliza Thompson House is a boutique hotel with a true southern feel. Built in 1847, the property consists of a main house and carriage house, with 25 individually designed rooms, a lovely courtyard patio, and lush gardens. For something a little more contemporary but equally enticing, The Brice, a Kimpton Hotel is the best bet. Mid-Range Hotels: On the edge of the Historic District, near Emmet Park and overlooking the riverfront, the Homewood Suites by Hilton has a rooftop pool and patio. The Marshall House, dating from the mid-19th century, is a small, delightful hotel, with an awesome location, close to Bull Street and the riverfront. Overlooking Savannah's famous Forsyth Park is the Forsyth Park Inn, a historic Queen Victoria mansion with high ceilings, huge doors, and quaint indoor and outdoor sitting areas. This is a B&B, serving a full gourmet breakfast. Budget Hotels: True budget hotels are found a short distance outside the city center. La Quinta Inn & Suites and the BEST WESTERN Savannah Gateway both offer basic, comfortable rooms and are an easy 15-minute drive from the Historic District. Slightly closer is the Baymont Inn and Suites. All of these hotels have pools and offer a free breakfast. 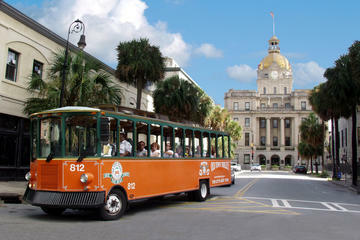 Sightseeing by Trolley: One of the most convenient ways to get the most out of your sightseeing is the Savannah Hop-on Hop-off Trolley Tour, which gives you flexibility while getting to all of the city's top tourist attractions. A well-versed guide will provide fascinating commentary about the city's history and culture as the trolley makes its route along 15 stops, including major sites like Forsyth Park, the Juliette Gordon Low Birthplace, and City Market. 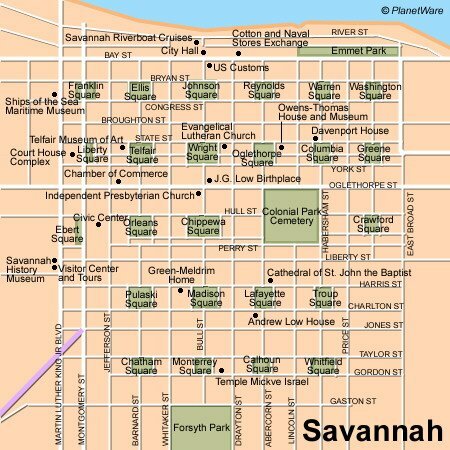 Walking Tour: The 90-minute Savannah Walking Tour gives tourists the opportunity to take in the beauty of Savannah at a slower pace while learning about the city's rich history as a strategic port and center of colonial government. Beginning in the beautiful Reynolds Square, the tour explores Savannah Historic District's many landmarks, both the well-known and those known only to locals. Cemetery Tour: Tourists who are looking for a meaningful visit to the city's famous cemetery will want to book one of the Bonaventure Cemetery Journeys with Shannon Scott, local historian, author, and storyteller. During the two-hour tour of this magnificent cemetery, tourists will learn about Victorian burial traditions, artwork and symbolism within the cemetery, and other fascinating details.